One of the fundamental features in Project Butterfly is its co-editing feature. People have been discussing it in forums and blogs, and we would like to present to you the key benefits of the feature. Co-editing is the feature in Project Butterfly that enables two people to edit the same drawing simultaneously. It speeds up the process of designing, when another person’s input it necessary. For instance, it’s very hard to put into words a request to change the geometry of a complex wall, or plumbing. You can start a co-editing session when you don’t have enough time to meet in person. For example, if you need to discuss a design with a colleague in another state, or when your schedule is just full and can’t afford the time to travel to another city. 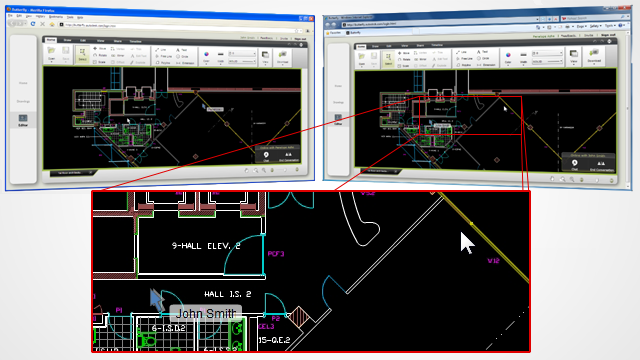 It eliminates the need to redraw changes that have been discussed in an in-person meeting, or changes you received in a separate DWG file. Ever had someone send you their input on a DWG after you’ve already updated your version of the same drawing? The documentation of the session – changes and chat history – is stored and you can view it at any time, via the Timeline (ribbon tab). Both sides of the session see the exact same view of the drawing – such as pan, zoom, layers, stylesheets and fonts. The recipient side doesn’t need a Butterfly account of his own. He just joins in the session from an invitation you send to him. Your recipient doesn’t need any software or files (i.e. you don’t have to send him the DWG or anything else). Sounds good, right? It is. Click on “Co-edit” in the bottom-right widget. Enter your recipient’s email address. Now all you have to do is wait for your recipient to join in, and you’re good to go. Did you have a successful co-editing session? Tell us about it in the comments, or contact us. This entry was written by Butterfly, posted on January 22, 2010 at 8:15 AM, filed under News. Bookmark the permalink. Follow any comments here with the RSS feed for this post. Post a comment or leave a trackback: Trackback URL. I want to congratulate you for your great work. I think that in the near future, your concept will alter the way cad users around globe will work and develop their projects. Of course there exist a lot of practical issues to resolve. What you say is true, both software and content migrate slowly to the Web and there’s no doubt it will change the way we use AND consume. LO descubrí hace 2 días por el bolg de Construcgeek y Estoy MARAVILLADO!!! Yo trabajo en Bs. As. y la fabrica que enviamos los planos (estructuras metálicas) esta en V. Mercedes San luis. (1.100km) y voy a intentar utilizarlo. EL MAYOR DESAFIO es que los demas aprendan a usarlo y vean sus beneficios. Por lo pronto me parece muy amigable. Thank you very much, Leonardo! Very happy to hear that co-editing is helpful to you. Feel free to give us more feedback using the “feedback” button on the app.